A Lunch-Read Novelette, Space Marine adventure! Follow The Squad as they engage the Maxans in an attempt to recover a handful of captured Human scientists. Can the mission succeed? Sergeant Balls and the rest of The Squad will do their best! If you want something fun to read over lunch or while waiting for your oil change or bus ride, this series is perfect. As an old Marine, I enjoyed this book. Yes, it's short, but that just means that a lot is packed into a little. It's also a KU title, so easy to grab. 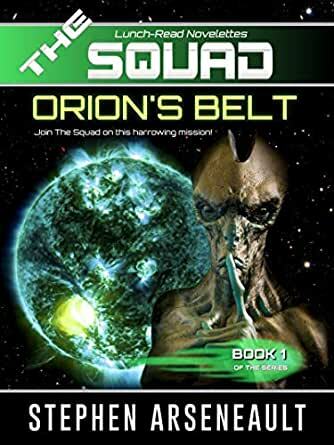 A good, action packed story of Marines in an assault on an enemy controlled starship. I also enjoyed some of the humor. Sarge is a part of the (working from memory here, so may be slightly off) Earth Alliance Terran Marine Element. EATME for short? Hahaha...Marine humor. ;) Yeah, we're just warped enough to see acronyms as normal as they are part and parcel to military jargon. If you enjoy Marines and military sci-fi, you'll enjoy this book. I am looking forward to the next one. After I read two of Arneautt's series's I took a break from his work, as they followed exactly the same storyline. But I came back and read this, thankful I use Kindle Unlimited. Quite easy reading, and the quality is consistant. I was looking for "ette" 2 when I saw they have been compiled into 3 larger compilations, each with 5 ette's. Having them as a larger book for 300-400 pages has really upped the enjoyment value, and I've just finished all 3 compilations. Looking forward to the next ones !